At our Newark Innovation Centre, T0 applications were applied to both Spring barley and Winter wheat at the end of March. Unsurprisingly, the crops appear to have significantly more foliage/vigour compared with last year. 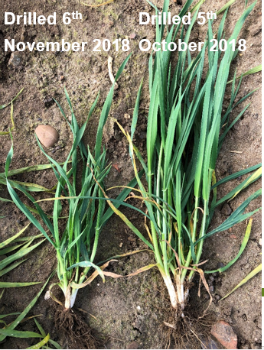 Given the relatively kind winter, crops are looking fairly clean.Generally, most winter wheats have a level of Septoria on the older leaves, with Yellow rust only evident on the most susceptible variety (Reflection). Brown rust was present on most Hybrids a few weeks ago, but now is not as evident. However, an infection of Net Blotch has been spotted on a Hybrid variety. 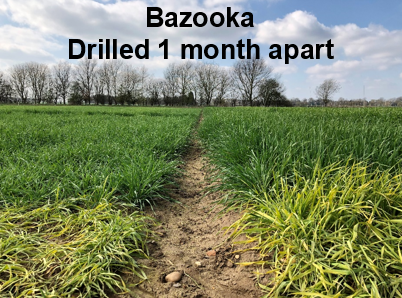 There is a clear difference to be seen between Hybrid variety Bazooka drilled 5th October 2018 and Bazooka drilled one month later on 6th November 2018. The trial proves how the drill date is an important factor with regards to growth stage and crop advancement.